Thank you for taking the time to read our newsletter. Since becoming a certified "green" office in 2014, one of our major objectives has to become more and more "paperless." Part of that includes moving away from the mailed newsletters we would send in the past, which used a lot of paper and ink, and switching to electronic mediums like e-mail. We hope you find the information we send you to be fun, informative, and interesting. We'll be sure to talk about any popular dental topics that you might hear about on the news, as well as let you know what we have been up to outside of the office. This August, our office celebrated two wedding anniversaries. On August 16, Gina and her wonderful husband, Taylor, celebrated their first year of marriage. 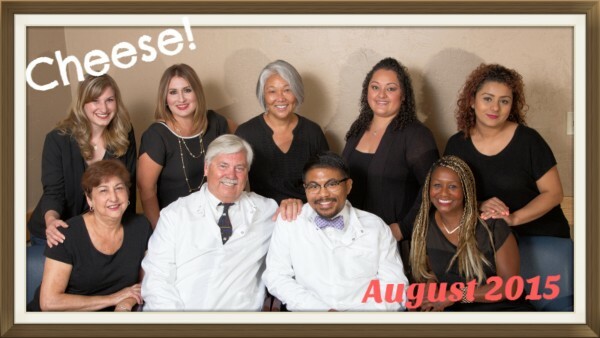 Dr. Castro and his lovely wife, Lindsey, celebrated their first year on August 23. Dr. van Dyk officiated both of their ceremonies, so it's no wonder that the passion and love is still strong in both of their relationships. Be sure to congratulate them and ask them what they did to celebrate the next time you come in! Dr. van Dyk is an official speaker for the American Dental Association, the governing body for all dentists in the United States. He gives lectures on practice management to dental schools, dental societies, and at dental conventions all across the country. This year has been his busiest year ever. Just a few states he has been to include: Texas, Louisiana, Alaska, Michigan, Nebraska, Illinois, West Virginia, New York, and South Carolina. Ask him for his opinion on airplane food the next time you're around. This month our staff celebrated two birthdays. On August 15, Marlene and Luz both became another year older. We'll let YOU ask them how old they are the next time you come in. On August 21-23 our whole office attended the California Dental Association convention in San Francisco. We learned the latest information all aspects of dental practice. We made sure to take classes that would allow us to make our service more comfortable and convenient for you. This included courses on new, more conservative technology to combat cavities, modern techniques for improving gum health, and updates on sterilization and cleanliness. Apparently there is a new, safe dental liquid that works great for kids with a lot of cavities or older adults who suffer from dry mouth. It's cutting edge stuff! On the last day of the convention, Dr. van Dyk gave a day-long lecture to young dentists about how to run a successful dental practice. It was a fun weekend of learning and we can't wait to go back next year! Are there any subjects you'd like for us to talk about in the future? Please write them down on our office's Facebook, e-mail us at williamvandykdds@gmail.com, or let us know the next time you're in the office! Have you ever wondered why our office tries so hard to get you to come in every 6 months? Is it because we love giving you a rose after every visit? Is it a gimmick to produce more income? It can be an expense, but it's a very important part of ensuring your good dental health. Dental decay and gum disease are both painless until they become very serious. Decay has to get very near the nerve before being painful, ensuring at least a root canal or an extraction. Gum disease needs to be severe with so much bone loss around the teeth that by the time you feel it, many teeth cannot be saved. The only way we can prevent these things from happening is to catch the disease process in its beginning stages when you can’t feel it. Small decay found during our exam or through the x-rays we take can be fixed with a simple filling or maybe crown. Gum disease can be arrested before too much damage is done. This process helps us ensure that you keep your teeth far into your senior years, often forever. So give us a chance to help you by coming when we call. How can straighter teeth help you? Any person with crooked teeth can tell you that it's not just the appearance of their teeth that bothers them. A big challenge, and the one that our hygienists stress the most, is the difficulty in keeping crooked teeth clean, especially lower ones. Ayako, Wendy, and Gina always do their best, but crooked lower teeth always have more plaque, build-up, and gum inflammation than other teeth simply because their awkward position too readily attracts and holds bacteria. If the teeth had better position or shape, less plaque would stick, and floss would more easily pass between the teeth. There are several options for treating crooked teeth: 1) do nothing, which doesn't actually address the problem 2) crowns or veneers, which would re-shape the teeth and make them straighter and easier to clean (but does involve taking away tooth structure) and 3) orthodontics, also known as teeth straightening, via braces or Invisalign, which moves the natural teeth with wires or trays but does take more time than a crown or veneer. How can straighter teeth help you?Any person with crooked teeth can tell you that it's not just the appearance of their teeth that bothers them. A big challenge, and the one that our hygienists stress the most, is the difficulty in keeping crooked teeth clean, especially lower ones. Ayako, Wendy, and Gina always do their best, but crooked lower teeth always have more plaque, build-up, and gum inflammation than other teeth simply because their awkward position too readily attracts and holds bacteria. If the teeth had better position or shape, less plaque would stick, and floss would more easily pass between the teeth. Call us if you'd like a consultation about straightening your teeth!